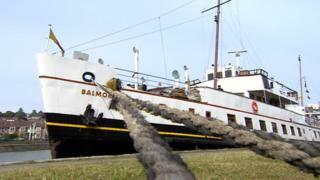 A vintage pleasure cruiser at the centre of a fundraising appeal will not sail next season, its operator says. White Funnel said the MV Balmoral, based in Bristol, needed major hull plating work before it would be allowed to sail again. The firm said its Bristol office would also close until further notice. A spokesman said the charity that owns the vessel - MV Balmoral Fund - would now focus on fundraising and a £3.75m Heritage Lottery Funding (HLF) bid. A statement from White Funnel said "substantial and costly improvements" were needed to the crew accommodation and a "long-accepted practice of using doubled plates to repair the hull was no longer acceptable" to the Maritime and Coastguard Agency. It said the cost of the repair work was included in the £3.75m bid. The operator said holders of concessionary or complimentary tickets should retain them for use when the service returns. The coastal cruise vessel - once the flagship of the Southampton Red Funnel Fleet - was built in 1949 to ferry passengers between Southampton and the Isle of Wight. It moved to the Bristol Channel in the late 1960s but stopped sailing in 2012. It returned to service in 2015 after volunteers raised more than £300,000 to save it. For the last three years, the vessel has provided excursions along the Somerset coast, north Wales, London, the east and south coast.